Pahoa, Hawaii (CNN)"You might want to step back," said Darryl Clinton as yet another explosion boomed nearby. He seemed to know exactly what that sound meant. A fissure that violently cracked open the earth's surface was spewing more lava and, possibly, more lava bombs -- flying chunks of molten rock. 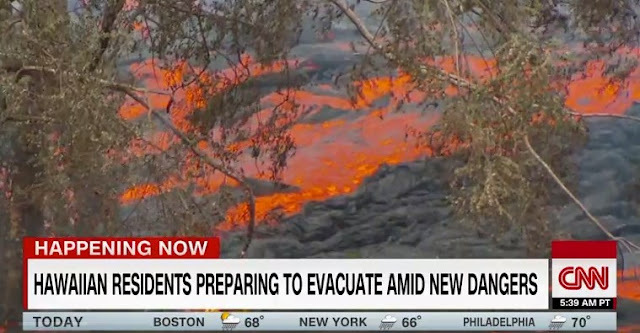 Clinton spoke to CNN on Friday, while defending two homes in Pahoa roughly 100 yards from the unstable fissure that's been erupting for more than a week now. Even to get from one house to another takes a life-or-death game of frogger. Clinton pointed to the remains of one lava bomb purged from a nearby fissure that landed just inches from a friend's house. The yard was littered every few feet with with fallen lava, but Clinton wasn't worried about getting hit by the hunks of molten rock. "It's almost like catching a football," Clinton said in describing how to avoid being hit. "But you don't want to catch this football." Armed with just a fire extinguisher and a garden hose, Clinton has been defending the homes that belong to friends. He's been spraying down the burning lava bombs that hit the houses to prevent them from catching fire. Heaps of flaming rock have already shattered windows and destroyed a septic tank -- setting it ablaze with a blue flame of burning methane gas. A day later, Clinton fell victim himself -- distracted by his cell phone for mere moments, when a bowling ball-sized lava bomb hit him in the leg while he was standing on the porch. His friend and ex-wife Lisa Roach was nearby and able to take him to the hospital. She had been helping him defend the homes -- the pair were keeping watch in shifts. Roach told CNN she believes the intense heat of the lava bomb actually cauterized the wound, preventing it from bleeding more than it did. The burning projectile also set Clinton's porch ablaze, but a neighbor managed to extinguish it. Clinton is currently in the hospital, recovering. Roach said he can already wiggle his toes, but won't be able to put weight on his injured foot for at least six weeks. He's had two surgeries already, and will likely have more, but is expected to recover. Big Island residents have endured thousands of earthquakes, relentless lava flow and dangerous levels of sulfur dioxide since the Kilauea volcano erupted earlier this month. What's worse, fissures that look dormant can suddenly rage back to life, shooting fountains of flaming rocks into the air again. But no one can predict when or where the next eruption from the ground will happen, or where the lava flow will go next. "It's all a guessing game," said Bruce Tickell, who owns two properties in the Pahoa area. Dona Mueller is also packing up to leave her home. Deafening fissure explosions have been shaking her house. "You can see it blew out this window," Mueller said, pointing to shards of glass on her upstairs bedroom floor. Her family came to help her pack, but Mueller's not taking much with her. "There's not much," she said. "I can walk away. It's stuff." 0 Response to "Man defending Hawaii home from volcano is hit by flaming 'lava bomb'"